Tsehaye Debalkew, May 14, 2010 (Washington DC) - Ethiopia has been granted Birr 1,326,000,000 (One Billion and Three Hundred Twenty Six Million Birr) for its performance in education and its drive to meet the Millennium Development Goal (MDG) set for the sector. One thing we are pleasantly surprised about the Derg regime is that how it has managed to preserve its atrocities. The following story is a story of our Jeganuna . 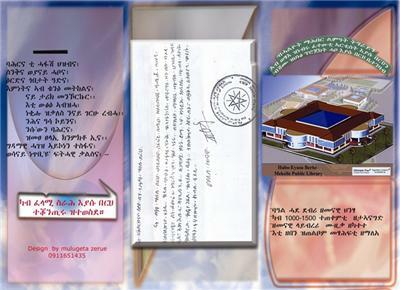 The story is about heroic TPLF/EPRDF Fighters who fell in to the hands of the Derg. Listen to Amora being interviewed by the then Derg functionaries. Listen to Amora’s unwavering stand and courage even though he knew death was around the corner! After you have listened, close your eyes and try to understand what went in to the struggle to bring today’s democracy in Ethiopia. Try if you can, to understand Amora’s words with that of Medrek ‘s and those trying to undo Article 39! To Amora’s mother and all the other 13 Mothers of our Jeganuna, we thank you!!!! FM Seyoum on Election 2010!!! 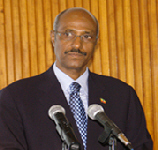 This week, Eritrea’s Foreign Minister, Osman Salih, headed an Eritrean delegation to Sudan. The delegation was taking congratulations from President Isaias to President al-Bashir...As we noted last week, the Government of Eritrea appears to be making efforts to try and minimize the effects of the sanctions imposed by the UN Security Council last December (UNSC Resolution 1907 (2009)). May 13, 2010 -- The Ethiopian Electric Power Corporation (EEPCo) and the Dongfang Electric Corporation, a Chinese company, signed 459 million USD project accord on Wednesday that enable the company execute the electro and hydro-mechanical works of the Gibe III Hydroelectric Project. ADDIS ABABA (AFP) - The United Nations and Ethiopia appealed Wednesday for 13 million dollars to help the increasing number of Somali refugees entering the country each day. TANZANIA PLANS TO BUILD a 170-kilometre water pipeline from Lake Victoria to benefit an estimated 4,000 people in its arid northwestern region. A report by the World Health Organization finds Africa is the region least likely to achieve the health targets set by the U.N. Millennium Development Goals....While the outlook for Africa is generally grim, she notes some African countries are doing much better than others. "If we just take child mortality, under five mortality, we have seen some enormous declines of over 40 percent in countries as diverse as Eritrea, Malawi, Ethiopia, Mozambique and Niger and Namibia. Several of these countries faced enormous challenges in the 1990s including civil conflict," she said. The federal Cabinet has approved sanctions against Eritrea in response to the African nation's support for a Somali militant ... The sanctions include a ban on weapons sales, and Canadian banks have been ordered to freeze any assets belonging to Eritrean political leaders and military officials. Kitty, come down to earth! Response back to our roots, back to Geez. The article is a good reading material to those opposition groups who are planning to privatize everything in the name of neo-liberalism! Be warned or be informed at least! Back to our roots, back to Geez.